Frequent fliers who enjoy traveling light will love the Voyager duffel from a Los Angeles-based design company called This is Ground.The handmade leather bag offers a slew of nifty features that will certainly come in handy on the road, as well as some unexpected perks that you won’t find elsewhere. One of the first things you’ll notice about the Voyager is its striking good looks, which help to convey the sense that this bag comes from bygone era. But don’t be fooled by first appearances, the Voyager is definitely a modern carry-on in every sense of the word, and as such it was built to accommodate technology to the fullest. The main interior compartment of the Voyager is surprisingly spacious, accommodating plenty of clothing for a weekend away, or perhaps longer if you happen to pack particularly light. There is even room for an extra pair of shoes or two if absolutely necessary. Despite being able to swallow up all of that gear however, the duffel still manages to maintain a fairly low profile, which makes it easy to slip into an overhead compartment on board an aircraft. An easily accessible exterior pocket offers some very nice additional storage options for our tech gadgets as well. 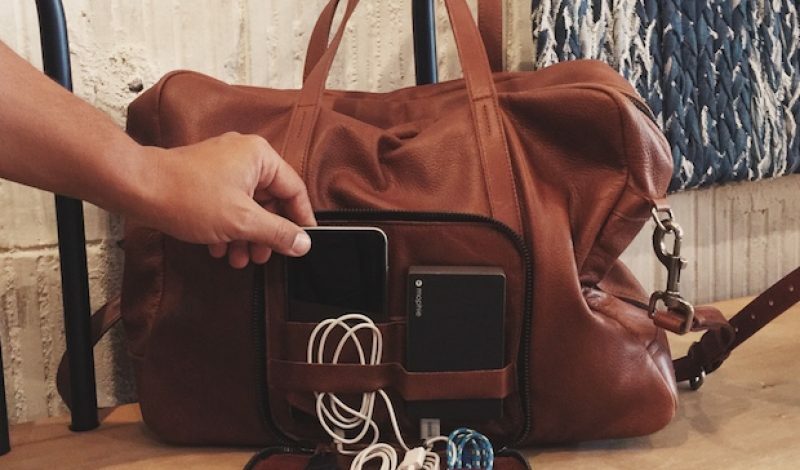 It includes a place to store you smartphone and passport, and a number of organizational loops for keeping charging cables, pens, earbuds, and other miscellaneous items close at hand. This simple – but very effectively designed – compartment helps the Voyager to stand out from the competition. But that’s not all. This bag also comes with an optional Wi-Fi connection too. This is Ground gives customer the choice of adding a wireless router to the bag, which grants access to the Karma network – a pay-as-you-go service that operates in over 450 U.S. cities. The addition of the Karma Go router does add to the price of the bag, but it also comes with its own specially designed leather sleeve that allows it to integrate directly into the Voyager. This great new option for travelers is set to begin shipping soon but be warned, it comes with a hefty price tag. The beautiful Voyager duffel, which is available in five different colors, will set you back $725, plus an additional $200 if you add the Karma Go. That definitely puts it out of the price range for most of us, no matter how useful it might be.